Honey Reviews: Does This Browser Extension Really Work? Honey Review: Does This Browser Extension Really Work? 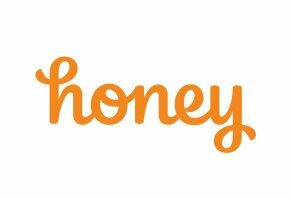 Honey is a discount tool that integrates into all major web browsers and automatically generates coupon codes for the site on which you’re shopping. The company is based in Los Angeles and was founded in 2012 by George Ruan and Ryan Hudson. Ruan’s resume includes two runs as the co-founder of startups as well as being the CEO of a company that is no longer in business. Hudson’s background features positions in revenue-focused departments at Fairhaven Capital and the Los Angeles Times, as well as a two-year tenure as a product manager at OpenX. Over the past six years, the company has grown in its popularity to the point that more than 10 million people have installed Honey through the Google Play store. In this review, we will provide you with our analysis of how the app works, give you our first-hand experience with the app and then cover the opinions of actual Honey users. Pro tip: Honey is available in the U.S., Canada, the United Kingdom, and Australia. At the time of publishing, the Honey extension is available for Chrome, Safari, Firefox, Opera, and Edge. Installing Honey into your browser is simple. Go to your browser’s web store or download center and search “Honey.” Honey is an “extension,” which means it’s like an app that runs inside your browser. You'll have to provide an email address and a password to set up the account but, once you do, Google activates Honey in your browser. You’ll know that it’s ready to roll when you see a small grey box with a cursive “h” in the top right corner of your browser. Whenever you go to a retail website, the grey Honey box will light orange and a smaller green box will appear containing a number that represents the number of discount codes available for that site. We’ll talk a bit more about this later when we walk you through our first-hand experience. Do your shopping on the retail site as usual. 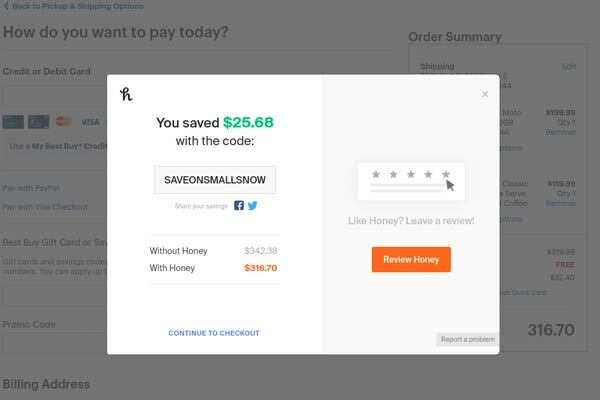 When you get to the checkout page where you can enter a discount/coupon code, Honey will activate a pop-up window telling you they have discount codes available. At that point, you click the Honey pop-up to get it to apply all its most successful coupon codes to your shopping cart. If those don’t work, then you can click another button to try coupon codes that rarely work. A successful coupon code results in a window that tells you how much you’ve saved in the form of a dollar amount in green font. This coupon code search is the primary function of Honey. However, it has a couple of other useful features you should know about. First, Honey has a “Drop List” through which you can watch items on various websites and get a notification when the price of that item drops. When you first set up your Drop List, Honey will ask to connect to your Amazon account, then provide you with a series of six items you’ve recently searched. You can choose to add these to your Drop List, or do some searching on your own and add items as you see fit. What’s nice about their Drop Lists is that, not only will it notify you of a price drop, but it also provides a price history for the item going back as far as 30 days. We added an Instant Pot from Amazon to our Drop List and was able to see that, in the past month, the current price of the Instant Pot was the lowest price in the past 30 days. Another feature Honey provides is a rewards program similar to what you’d get if you used a rewards credit card to make purchases. Honey’s rewards program is called Honey Gold and you earn “gold” points when you shop on sites (more than 4,000, Honey says) for which there are Honey Gold bonuses. Keep in mind, though, that you don’t automatically get the Gold bonus. You’ll have to click an “Activate” button in order to earn the Gold. Honey notes you also have the option of donating your $10 reward to charity. We did a deep dive into Honey’s fine print and discovered that the company doesn’t sell your information to third parties. To clarify, we talked with Honey co-founder Ryan Hudson. He told us that the company protects your personal information. According to Honey’s FAQ section, they don’t make money from your information. Rather, they sometimes earn a “small commission from the merchant” when you use certain coupon codes or earn Honey Gold. We wanted to get a good sense of how the tool worked, so we signed up for an account and shopped at Walmart, Amazon, Target, and BestBuy. Honey didn’t provide any promo codes for Walmart but it did for the other three sites. Unfortunately, there weren’t any discount codes that applied to our various purchases on Amazon and Target. So, we headed to BestBuy to try out luck again. Turns out we received a discount because the Keurig qualified as a small home appliance and, as such, was eligible for the promo code we got from Honey. After the fact, we discovered that you can do department-specific searches for websites to help you figure out which codes are available for the things you want to buy. However, based on our experience, it was easier to run Honey’s discount codes during checkout than it was to search for which items got discounts. And this small scenario reveals the two uses we see the average consumer getting out of Honey: in-the-moment discounts and discount shopping planning. You see, you can utilize Honey as a last-second push for discounts when you’re ready to pay for something. Or, you can use it as a place to search for discounts on things you want to buy to find out if the discounts you get at specific stores make the item cheaper at those places/sites than at other stores and sites. More than 100,000 Chrome users left Chrome web-store reviews that gave Honey an average star rating of 4.8 stars, which is virtually unprecedented for apps and extensions. We’ve featured the Chrome web store reviews because they are by far the most numerous out of the various review sites for the browsers Honey supports. Mozilla Firefox users gave Honey an average of 4.5 stores, while Edge users gave the extension an average rating of 4.3 stars. Based on all of this data, we believe there’s a high probability that you’ll have a positive experience with the Honey app. As we mentioned earlier, we believe that you can use honey one of two ways: to research good prices on specific items and to do a last-second check of discounts before you pay for something. Because the second option is more efficient than the first, we believe the best way to leverage this extension is to install it in your browser and check for discount codes every time you’re able to enter a code during checkout. Honey is best served as an integral part of your purchase process – just as important as entering your credit card information. Considering that it only takes a few seconds for the tool to run through all available discount codes, the money we saved (around $25) during our test run was well worth the short amount of time it took to install Honey and check discounts. We also believe this is a great tool to use in the lead-up to your Christmas shopping. If you prefer to use Amazon for online shopping, make a Christmas list, log into Honey and then head to Amazon and click on the various items you want to add to your Drop List. This way, not only will you have an actual list of things you want to buy for friends, family, and coworkers, but you’ll also get notifications when those items drop in price. And, if there are eligible discount codes for your purchase, you’ll get even bigger savings. Write a Review for Honey!